Yard Waste Disposal | D&O Garbage Service, Inc.
It’s that time of year again! The weather is getting warmer and yards need cleaned up after a full winter of Oregon weather. Before disposing of your yard waste please take a few things into consideration. Do not place carts out that have branches sticking out from under the lid. If branches are too long please cut them so that they fit completely in the cart with the lid closed. Branches can be no larger than 4” in diameter. Do not place any dirt, processed wood, metal, plastic or plastic bags in cart. Also no animal feces may go in this cart; please place this in a bag in your garbage container. Do not place Poison Oak in carts. This can expose a number of different workers who come into contact with these materials. 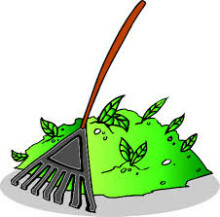 Do place grass clippings, leaves, weeds, flowers, plants and small tree trimmings no larger than 4” in diameter in container. Do place food waste in cart, this can include soiled napkins, coffee filters and restaurant style pizza boxes (with foil removed). Do place out at the curb with the lid facing the street for pick up prior to 6:00 a.m. on your service day. D & O Garbage Service, Inc.